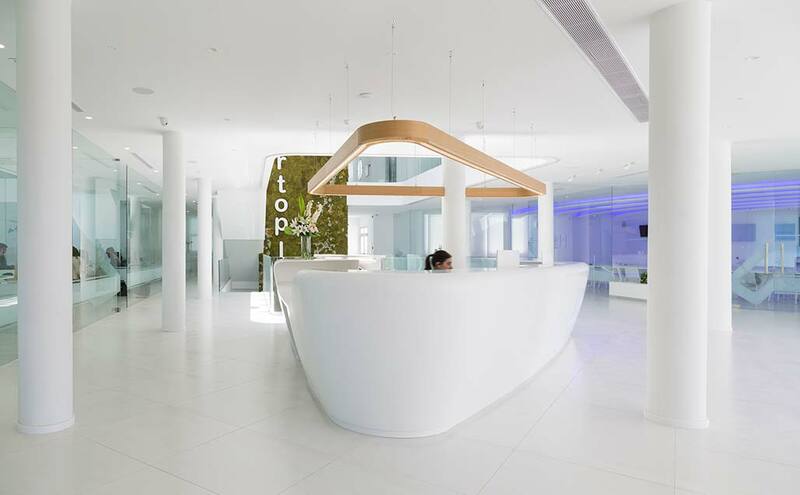 In the capital of the Costa del Sol (Málaga) Grupo Ortoplus is found with its divisions – Alineadent, invisible braces, and OrthoApnea, solutions for sleep apnoea and snoring – having used PORCELANOSA Group and KRION K-LIFE for the impressive installations designed by Antiqua Design. Ortoplus is a world-renowned digitised dental laboratory. After its 25 years of work, this group today offers an extensive range of dental services ranging from the production of orthodontic appliances and intraoral devices in the field of oral sleep medicine, to advanced solutions with latest generation equipment in the dental sector. This cutting-edge company has been perfectly portrayed by Antiqua Design in its new installations, in which the new generation solid surface which purifies the air, KRION K-LIFE, has been chosen. K-LIFE means commitment, which Ortoplus and Antigua Design have portrayed in the large hall, with a monolithic reception in the form of an organic toroid, in which KRION 1100 Snow White EAST presents some of its renowned properties such as thermocurving and imperceptible joins, as well as the new properties of K-LIFE: air purification, antibacterial properties, elimination of chemical products and easier cleaning. We can also find KRION K-LIFE in the bathrooms of the facilities, the whole project having been transformed by the company Galián Solid Surface.